Frequently referred to as the King of Fruits, the durian fruit is a tropical fruit grown in Southeast Asia that’s rapidly gaining worldwide popularity and becoming an important staple of the region’s economy. Durian is a word that’s used to categorize several fruit bearing trees that produce a large, hard fruit that’s covered in spiked flesh. Although there are hundreds of different types of durian trees that grow in Asia, only about nine of the species produce a fruit that’s suitable for human consumption. People who regularly consume durian fruit love its unique taste which is often described as tasting like almond flavored custard. Anyone who suffers from gout should notice a significant decrease in their symptoms when they eat a durian fruit every single day. The sharp spikes set into the skin of the durian fruit are intimidating. Happily, it’s possible to get to the sweet tasting fruit inside without poking your fingers, though you’ll want to wear clean, protective gloves. 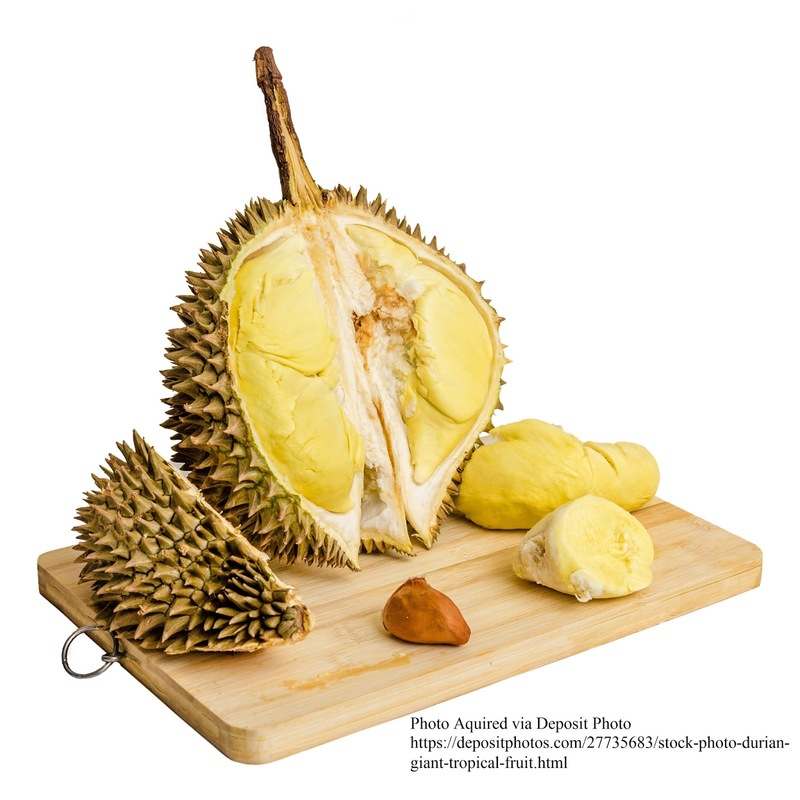 Simply place the durian fruit, stem side down, on a cutting board and use a large knife to cut the skin. Once the cut is 3-4 inches long, set the knife aside and use your hands to pull the rest of the skin apart. Once you’ve done this, you can spoon the fruit out. In addition to eating the fruit’s meat, you can also boil the seed and consume that as well. It’s also quite nutritious and tastes like jackdaw fruit. The durian fruit possesses two unique features. The first thing you notice about the tropical fruit is its spikey appearance. The hard shell is covered with spikes which are sharp to the touch. The second characteristic that most people notice, and the one that bothers Westerns the most, is the fruit’s unique smell, which has been compared to everything from rotten onions, to sewage, to limburger cheese. It’s strong enough that many people refuse to get close the fruit, much less eat it. The scent is strong enough and offensive enough that many buildings and airlines have banned it. However, if you’re willing to ignore the smell long enough to sample a piece of the fruit, you’ll quickly decide that the flavor trumps the fruit’s scent. It’s important to understand that the scent of the durian fruit is an actual characteristic and not a sign that the fruit is spoiled or rotting. Recently, a group of scientists representing the German Research Center for Food Chemistry took it upon themselves to learn, once and for all, why durian fruit has such a peculiar odor. Determining which components created the memorable scent required the use of both a chromatograph and a mass spectrometer. With the help of the machines, the research team learned that no less than fifty different compounds come together and create the unique durian fruit perfume. Even more surprising than the sheer number of components involved in the process was that no less than eight of them had never been seen before. Now that science has managed to identify the specific compounds responsible for the fruits odor, they can start exploring whether there’s a reason nature saw fit to bestow the fruit with such a strange scent. One possible explanation is that the strong odor helps attract monkeys and other animals that enjoy durian fruit from long distances, which aides in the disposal of the seeds. For as long as people in Asia have enjoyed durian fruit, there have been warnings about not consuming alcohol at the same time, though no one was completely sure why. In 2009, a study was conducted in Japan that revealed that when you eat a durian fruit, your liver struggles to use aldehyde dehydrogenase (ALDH), and enzyme that aides with the body’s breakdown of alcohol. What does this mean? That there’s a chance that the combination of durian and alcohol could result in death.